�����The tracking of specific coins over a period of time is a favored strategy of the advanced numismatist, but can also be a great approach for those who have just started their journey into coin collecting. 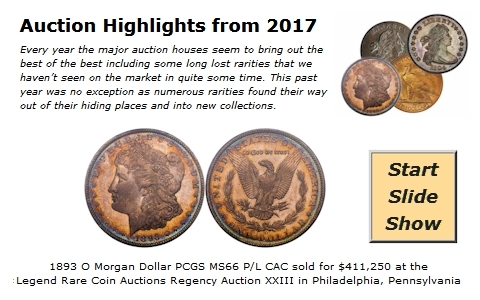 New collectors can get a general idea of how a coin has performed over the years to determine if it has followed the general trends of the coin market or if it is just a by-product of the coin market. For example, the majority of the modern coins that do not contain Gold or Silver and grade below MS65 are simply a by-product of coin collecting. They are an entry point into numismatics, but they rarely change in value, or if they do it is marginal. �����Even though these modern coins, for example the State Quarter Series, are not rare, they still have been an essential part of the coin market as they continue to initiate interest in coin collecting. These by-product coins are developing the next generation of coin collectors, the future advanced numismatists, progressing from modern coinage to a pursuit of rare coins, studying the current and past markets, using tools such as online price guides and pricing charts to discover the next great rarity. �����The two charts below display price progressions for sets of Walking Liberty Halves in MS64 and MS65 over an eight year span. The fluctuations between the highs and the lows of the two grades are around 10%. There are a couple of important facts you should know about completing a set of Walkers in the MS64 and MS65 grades. The 1921 S has the least number of MS64 coins certified by PCGS and NGC with a total of 104, limiting the amount of possible complete sets. Also keep in mind that this number may be exaggerated slightly due to the number of coins that are resubmitted to both grading services. Even rarer is the MS65 complete set with the 1919 D having a mere 15 coins certified by both services. �����The FMV comparisons of the set prices fluctuated according to market supply and demand. The low point for the MS64 set was October 2012 with the FMV priced at $192,645. Much of this has to do with the values of the more common coins drifting lower as large quantities were made available. After 2012, the better dates began to see higher prices. 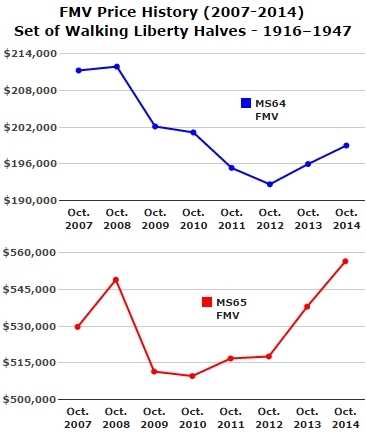 The low point for the MS65 set was October 2010 when the FMV fell to $509,575. Again, much of this discounting had to do with the more common coins, although even some of the better dates were not in excessive demand at this time. After 2010, MS65 coins from 1916 to 1929 S began to make a move and the complete set FMV started its rise. �����After studying the two graphs for MS64 and MS65 sets of Walking Liberty Halves, neither looks like a great investment. However, if you look at specific dates you will find a totally different story. As is the case with all rare coins, value directly correlates to population for the grade. While the set of MS64 coins actually shows a loss over the eight year timeframe, several coins have a higher FMV today than back in 2007. The 1920 D was $5,940, while today it is listed at an FMV of $7,810; that is an increase of over 30%. What is interesting is that there are 208 certified in this grade, which is a rather substantial population for a coin that has increased so significantly in eight years. Another rarity to note is the 1923 S in MS64 with a current FMV of $5,340 versus the October 2007 FMV of $4,910. This is almost a 10% gain with a population of 209 coins for the grade. �����The real increase over the last eight years for rare Walkers begins to show up in the MS65 grade. The chart below shows the date, the previous FMV, the current FMV and the number of coins certified in the MS65 grade. �����The majority of these examples have less than 10 coins certified higher than MS65 with very few showing any MS67�s. The 1921 P, D, & S have no coins certified in MS67 and most of the other mint marked coins prior to 1929 S have just one or two coins certified at best. Further, it would be virtually impossible to put together a set of MS66 coins because there is only one 1919 D certified MS66 by PCGS and there are only two 1921 S certified coins in MS66, one by each service. �����Some of these rarities have seen the FMV fall because the number of coins certified in the specific grade increased substantially; thus creating more availability. Another point to keep in mind with the Walker series; it is littered with coins that have soft strikes. These coins will typically not command the current FMV levels unless they are extremely attractive. This brings up our final point: Walkers with a great strike, eye appeal, rarity, and low populations can create strong premiums. If the coin has been labeled with the + designation or the CAC sticker, buyers become exceedingly aggressive.